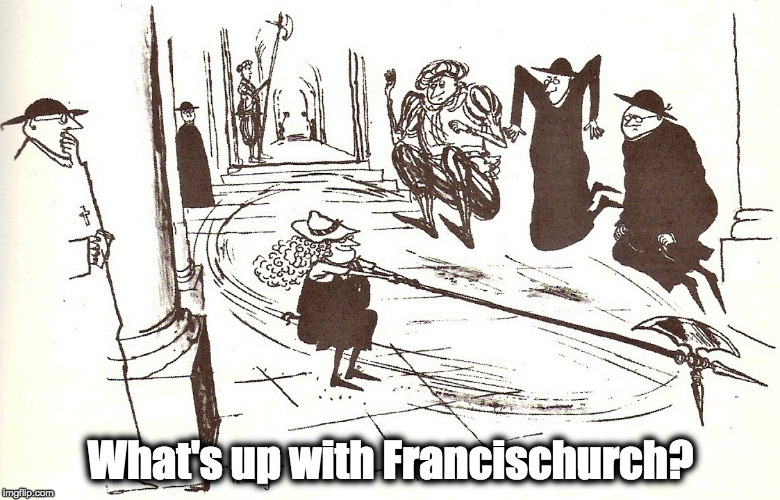 De-stupidification: put the iphone DOWN – What's Up With Francis-Church? Here’s a little taste of my latest for The Remnant on my experience of being (mostly) unplugged for two weeks. After fifteen years of steady and steadily increasing daily internet use, I can report that I have experienced actual withdrawal symptoms when I finally got fed up – mainly with myself – and cut it off in November. I had become accustomed to texting and chatting with my friends on Facebook and Skype, exchanging articles, information, witticisms and confidences every day, several times a day. Sometimes all day. Though I live by myself, I never felt alone. Truthfully, I never really was alone. This was the reality of my daily life, especially so starting a few years ago when I stayed in constant contact with my friends who cared for me during cancer treatments. That was the period, when I really did not have the physical wherewithal to pursue most of my other activities, that the ‘net really took over. That was when my books and hiking boots and paints really started gathering dust. It was this constant state of being plugged in, connected, that started to alarm me. I could no longer deny that there was something disquieting about its effects on me. How ill at ease I felt when I was not gazing at the ‘net, and the evident conflict between the growing spiritual need for silence and solitude, and this overwhelming urge to remain connected. But at the same time, how difficult I was starting to find it to concentrate, to read an entire article or even watch an hour’s worth of a streaming TV show. Since I cut it off in the last week of November, there have been moments when I have understood how a Star Trek Borg drone felt when severed from the Collective. Without the constant buzzing whisper of those voices, or the mental pressure to return to them if I were away for more than an hour, I was finally really on my own. I found myself often feeling bereft, aimless, with more time on my hands than I remembered what to do with. I even experienced brief periods of actual depression, where I felt strangely unable to emotionally apprehend my sense of life’s meaning, a strange and unsettling blank feeling. That was part 1 ““iCuriosity” : what is the internet doing to our minds and souls and families?” It is appearing in the print and e-edition of the early December Remnant issue, which you can get here. There is more coming on this subject. A while ago, I started thinking, “How much success would ISIS be having if they weren’t able to post all their little snuff films to Youtube, Facebook and Twitter?” What is the internet doing not just to us, but to our civilization? Part II on how the internet is creating a Great Stupidification will (probably) be in the next non-Christmas edition of The Remnant. It will focus less on personal experience, but more on the facts and figures, the statistics and what they mean for us as Catholics who believe in the Social Reign of Christ the King and the Catholic confessional state. I agree with your take on how the internet (specifically ‘social media’) is addictive and how it deprives us of the opportunity for prayer, reflection, and genuine society. To me it is akin to the Tower of Babel. It’s not prayers that breaks addiction or bad habits. It’s the exercise of the will. Cancel your home internet. For people like us, we can’t go incrementally. If it’s in the house, it will eat your life. If you have an iPhone, take a hammer to it. Thanks Hilary something my son said the othe day and now this. I need to unplug. Can you recommend any good prayers to end the addiction? I realised, reading this, I was once a prolific reader. Now I can’t concentrate enough to to finish a book. I need help!